(CNN) -- Germany's Sebastian Vettel led home Red Bull team-mate Mark Webber to claim an impressive victory in the British Formula One Grand Prix at Silverstone on Sunday. Sebastian Vettel rarely saw another car throughout the race as he stormed to victory in the British Grand Prix. Vettel's second success of the season leaves him 25 points behind world championship leader Jenson Button -- who disappointed the home fans by finishing down in sixth place, the position he started from on the grid. Button's Brawn GP team-mate Rubens Barrichello finished behind the dominant Red Bulls in third place, to close to within 23 points of Button in the world drivers' standings, with Vettel breathing down the Brazilian's neck. Vettel, who is the only driver apart from Button to actually win a race this season following his victory in China, was the dominant driver throughout the weekend. The 21-year-old topped the timesheets in practice and qualified in pole position after also blitzing his rivals on Saturday. 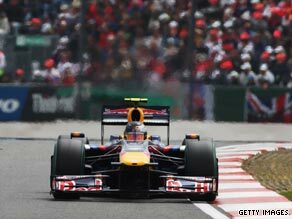 From his position at the head of the grid, Vettel never looked in any danger of being caught and -- apart from briefly conceding his lead to Webber after making his second and final pit stop on lap 45 before regaining it two laps later -- the result was never in doubt. Vettel eventually finished 15.1 seconds ahead of Australian Webber, who is still searching for his first Formula One victory. Felipe Massa claimed an impressive fourth for Ferrari despite starting down on 11th place on the grid, while the Williams of Nico Rosberg held off a fast-finishing Button to secure fifth. Jarno Trulli and Kimi Raikkonen completed the points scorers, while world champion Lewis Hamilton's dismal weekend -- and season as a whole -- continued with a lowly 16th position. A delighted Vettel told the post-race news conference that he was delighted to claim F1's equivalent of the hat-trick -- pole position, race win and fastest lap. "To win here is a dream. The start was important, and then in the first stint I knew I had to get away, which would benefit me for the remainder of the race. "I had a fantastic car and I'm very, very pleased with the result. It shows we are on the right track with the car and also back at the factory. "I also want to thank Silverstone and all the fans in the grandstand. It's only my second time here, but all the fans were cheering. This is what I was dreaming of when I watched Formula One in the era of Nigel Mansell and so on."